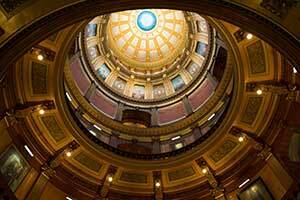 LANSING, Mich. — Sen. Dale Zorn has introduced legislation to eliminate the state sales tax on contact lenses. Michigan currently exempts certain devices from the state’s sales and use taxes, including eyeglasses; hearing aids; braces; kidney dialysis and oxygen delivery equipment; canes; walkers; corrective shoes; crutches; and pacemakers. Senate Bill 44 would add contact lenses to the list of devices exempted from the state sales tax. SB 43, sponsored by Senate Finance Committee Chairman Jim Runestad, R-White Lake, would add the exemption to the state use tax. The savings of the bills is estimated to be more than $12 million per year. According to the nonpartisan Senate Fiscal Agency in 2018, Michigan is one of 23 states that are full members of the Streamlined Sales and Use Tax Agreement, and 15 of those member states have exempted contact lenses from taxation.